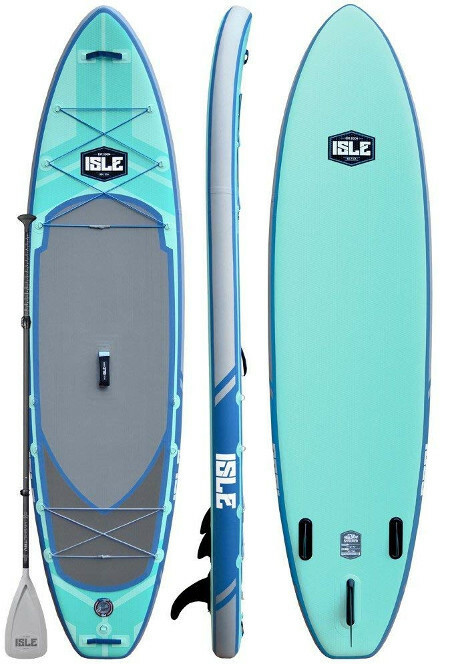 ISLE inflatable SUP boards are something else. Indeed, the secret of this brand is passion and that is something that can only be achieved by a leader that is actually in love with the sport. In fact, ISLE Surf and SUP was founded in 2004 by two Sand Diego surfers with a giant dream and the will to make it happen. The fresh out of college duo took it upon themselves to create an inflatable paddle board that can drive enough value to give the company a name. 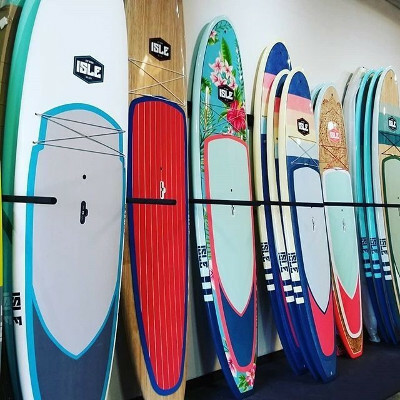 ISLE Surf and SUP now operates from a 15 thousand square feet HQ in San Diego where they develop some of the highest quality boards on the market. That sounds like enough of an introduction for the brand. Now, let’s allow their best-selling inflatable paddle boards to speak for themselves. ISLE Megalodon • 12'0" x 45" x 8"
• 15'0" x 56" x 8"
A quick look at the ISLE Explorer can already tell you so much more than we can as it is truly a beautiful board. It is a common rule not to judge a book by its cover but it’s a bit different when it comes to inflatable paddle boards since the structure and details on the surface can tell you so much about what to expect here. Accordingly, the board at hand is obviously pretty long, 11 feet to be exact, making it a perfect fit for young adult and adult paddlers. However, the company also has a different version of the same board that comes at 12 feet long which is a more competitive and bigger paddlers’ board. 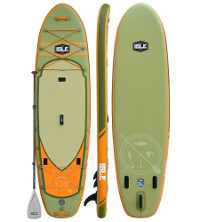 The board is keen on stability and paddler comfort which explains the 32 inches wide platform. Eventually, to connect the dots the way they should be, ISLE sets this board at a solid 6 inches in thickness, making this board robust and also capable of taking up to 350 pounds as a maximum load. Once you got your measurements on lock, your second concern should naturally be performance since you are willing to spend a healthy amount of time on this board. Accordingly, it is helpful to know that the board at hand has quite a reputation for being one of the best recreational performers on the market. Indeed, the Explorer is shaped like a rocket for a reason. With those smooth edges, the pointy lifting nose and the remarkable triple fin navigation system, you are set for a ride to remember every time you take this board out for a tour. Eventually, once you start to feel comfortable with a board, you should pay attention to the most critical aspect of which. Indeed, packaging is a large pillar for paddle boards since it can make a huge difference and impact your experience directly. Accordingly, ISLE Surf and SUP doesn’t risk defaming this majestic creation on a lousy package which is why the Explorer comes with everything you’ll need to tour, race, do yoga and take it wherever you want on at ease. The ISLE All Around is a less hostile design created by ISLE to appeal to a more laid-back paddlers. Indeed, this board is perfect for recreational activities and a way to soak in the fun of being on water. Therefore, if you can appreciate the design of this ISLE then you’re pretty much set to make your purchase. But wait a second, first, you must confirm that the dimension of this board are actually compatible with you as a paddler. Accordingly, the ISLE All Around is a big SUP board, It’s 10 feet 6 inches in length to be exact, making it a great fit for young adult and adult paddlers of standard sizes. Also, the board further emphasizes its ability to remain balanced and chill with a 31 inches wide platform. Eventually, to make the pick even easier for you, this ISLE actually settles for the highest thickness ever attained by a paddle board. At 6 inches in thickness, not only are you matched with a robust board that can endure any environment but one that is capable of handling up to 240 pounds at maximum capacity. 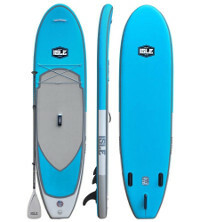 As far as performance goes, you are to be aware that this isn’t a competitive board but rather one that was designed with the intention to provide the paddler with an easy going, stable and reliable paddle board that will allow them to enjoy their time on water no matter the environment. That conclusion is supported via the board’s round edges, wider ends and tracking pro triple fin system. 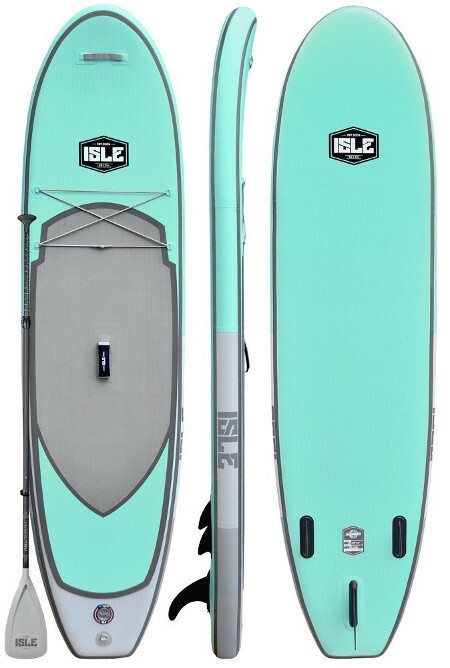 To top it all, the All Around ISLE inflatable SUP comes within a healthy package that includes literally everything you’ll need to maintain this board for as long as you own it. It is about time that paddle board companies begin to address the growing demand on yoga paddle boards but there is absolutely no alternative to the inflatable option. 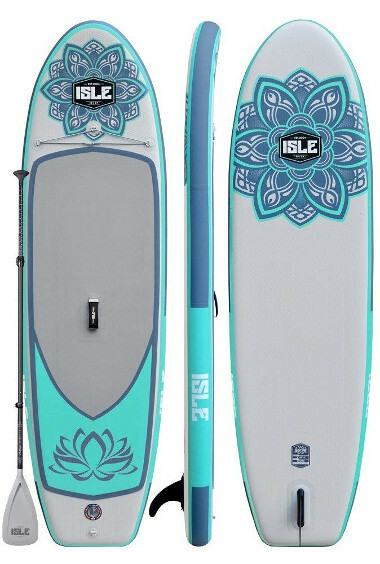 Indeed, the ISLE Lotus Yoga iSUP is a complete board with the ability to appeal to any female paddle out there but especially to those who have a soft spot for yoga. Now, this doesn’t have to be a strictly yoga board but what is strict about it is measurements. Indeed, the board is 10 feet 4 inches long which is great for adult and young adult paddlers but not so much for teenagers. Moreover, the board is so light thanks to ISLE’s inflatable technology that it was necessary to go for 31 inches in width to ensure the stability of this board cause it is meant for yoga after all. Lastly, the cherry on top of the yoga cake has got to be the 6 inches in thickness which will grant this board more strength and enable it to carry a maximum load of 255 pounds. As far as performance is concerned, you can tell that this board is going to be as stable as it is required to establish a proper yoga routine. 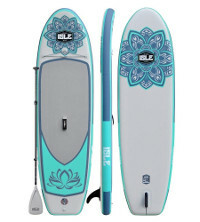 The board is designed specifically for yoga and that shows on the round and smooth edges and the lack of sharp twists and turns which might distort the paddler’s balance. Finally, the stability of the board is eventually supported via a triple fin navigation system to make straight tracking almost automatic. When you talk about ISLE inflatable SUP boards, it goes without saying that it will certainly be shipped with a complete package that includes all the requirements of the board and the tools you’ll need to maintain it for a long life. If ISLE learned one thing, it is that fishing is a passionate hobby and that requires a reliable vessel. 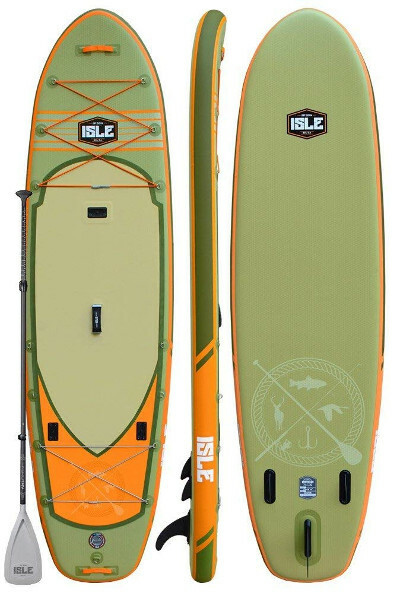 Accordingly, ISLE created its leading fishing inflatable paddle board in order to cater for a large slice of its audience and open up a new perspective on this sport mixed with paddle boarding. 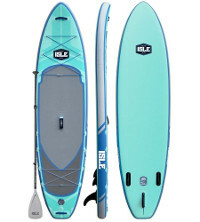 A fishing paddle board is indeed a fun idea but it is important that you get the iSUP that matches our size. Hence, the Fishing board stands at a splendid 11 feet 6 inches in length which is great for any fisherman out there. Also, to enhance the board’s stability, the brand goes with a 36 inches wide platform which is the largest on Isle. Eventually, to grant the board the strength it needs, the board goes for 6 inches in thickness which equates to a maximum weight capacity of 320 pounds. Now you can obviously carry along everything you’ll need on your fishing trip but that will impact the board’s performance. Indeed, the board is going to be slower the heavier the load but what won’t be reduced is its ability to keep everything balanced out. Indeed, this is a great board for fishing because of its wide ends and smooth turns and that is something to look for as a fishing enthusiast. As mentioned earlier, when you go for an Isle forget about packaging because it will be a complete bag. So, if you like the board and what it has to offer then you’re pretty much ready for your next fishing adventure.